When you connect a new iPod to your computer for the first time using a USB cable, iTunes displays the Welcome screen. If you’re setting up an iPod touch and you’ve synced it previously on the same computer, choose whether to use its settings by restoring from its backup or to set up the device as new. Set Up as New: Select this option if you want to set the iPod touch up as new. Restore from the Backup of: Select this option, and pick an iPad, iPod touch, or iPhone from the pop-up menu to restore the previous device’s name and settings. Your automatic sync settings are restored from the previous backup, but you can change them if you choose. Click the Continue button on the Welcome screen. iTunes displays the Sync with iTunes screen, showing you the iTunes tabs that you use to browse the iTunes library. After clicking Get Started, iTunes displays the Summary sync page. (Optional) Double-click the name and enter a new name for your iPod on the Summary sync page. Double-click inside the name so that it highlights and displays the text cursor, and type a new name. (Optional) Set your iPod sync settings. You can start syncing now, or sync later. If you sync now, wait for the message “Sync is completed” in the top status pane before continuing to the next step. Click Done and disconnect your iPod. Disconnect the device from your computer by ejecting it. To eject your iPod, click the eject button next to its name in the iPod sync button. You can then connect the iPod to its dock or power adapter to continue recharging its battery. 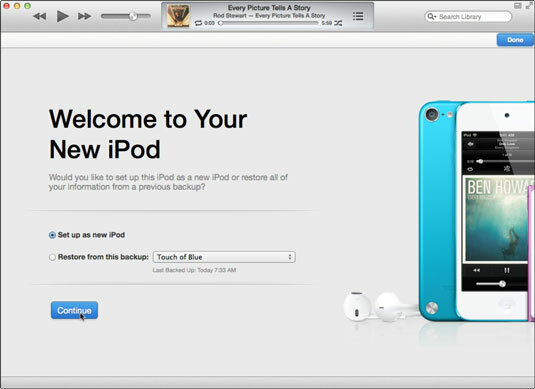 After ejecting the iPod, wait for its display to show the main menu or the OK to disconnect message. You can then disconnect it from the computer. Never disconnect an iPod before ejecting it because such bad behavior might cause it to freeze and require a reset. You’re done if you’re setting up an iPod shuffle, and almost done if you are setting up an iPod touch, iPod nano, or iPod classic. Skip to Step 8 for an iPod nano or iPod classic. 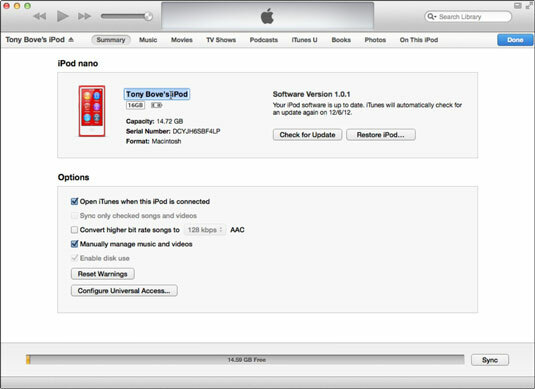 iPod touch only: To finish setting up an iPod touch, you need access to a Wi-Fi network and the Internet so that you can access the iTunes Store and iCloud to set up your online account. iPod nano and iPod classic: Choose your language on the first screen. Your iPod nano or iPod classic presents a list of languages. Choose your language (tap it on an iPod nano, or use the scroll wheel and click the select button to choose it on an iPod classic). That’s it, you’re finished setting it up. Now go enjoy it!